George Graham Reviews Keb' Mo's "Slow Down"
One of the performers who has helped spread the revived popularity of the blues is a gentleman named Kevin Moore, better known as Keb' Mo', who has just released his third album entitled Slow Down. Keb' Mo' has deservedly received a lot of praise for his previous efforts, including the 1996 Grammy Award for Best Contemporary Blues Album, and two W.C. Handy Awards for best acoustic blues recording. He seemed to emerge quite suddenly in 1994 with an album named after his "nom de blues," and was called by many a new artist, but his career is a rather lengthy one. Kevin Moore grew up in South Central Los Angeles of parents who were from Louisiana and Texas. The church was an early influence in his music, and indeed gospel provides the inspiration for one of the best tracks on Slow Down. But Moore was also steeped in the rock and soul of the 1960s, and interestingly, cites latin percussionist Mongo Santamaria as one of his first strong influences. By the early 1970s, he was enlisted by the late blues and jazz violinist Papa John Creach, who had just come off a stint with the Jefferson Airplane and Hot Tuna. Moore recorded with Creach in 1974. He also worked as a staff composer and demo producer for a music publishing company, and became part of the house band in a club in Los Angeles that hosted a lot of the great bluesmen including Big Joe Turner, Albert Collins, and Jimmy Witherspoon. In 1983 he released his first solo album, entitled Rainmaker on a label that soon folded. What kindled his interested in the Delta style blues was stint in theater. He was offered the part of a bluesman in a 1990 production of Rabbit Foot by the Los Angeles Theater Center. In preparation for the part, he plunged into historic blues recordings and soon found himself enchanted by the people who defined the music's early direction. He decided to adopt the name Keb' Mo' after a friend and musical colleague started calling him that when he was asked to play the blues. Since then, Moore, or Keb' Mo's combination of a solid musical background and first-rate songwriting has been attracting a lot of attention. Though he is capable of performing traditional-style Delta blues, his music is rather wide-ranging, running from folky songs reminiscent of James Taylor to mellow pop compositions, to more rocky electric tunes. Last time around on his 1996 album Just Like You, he was joined a band borrowed from Bonnie Raitt, and also featured Ms. Raitt and Jackson Browne as guests. This time, Keb' Mo' works with his own regular band, more or less, on his new CD, and for the first time also served as producer of his record in conjunction with John Lewis Parker, with whom Keb' Mo' co-wrote several songs. The result is another fine album that is not exactly blues in the pure, traditional sense, but which does incorporate acoustic blues styles in a mix that once again runs from rock to easy-going pop songs. It's all very tastefully done, and is likely to be another record that will win Keb' Mo' more fans, and in the process help increase awareness of the blues in general. Joining Keb' Mo' on the album are Reggie McBride on bass, Laval Belle on drums and Joellen Friedkin on keyboards. A couple of notable fellow contemporary blues performers, Colin Linden and fellow New Orleans resident Anders Osborne put in guest appearances, and in the case of Osborne, collaborate in the songwriting. Though some of the tracks on Slow Down can appeal to pop music fans, the album in general has a very nice, relaxed, predominantly acoustic feel. Indeed, sometimes one can hear some good-natured bantering in the studio at the ends of a couple of the tracks. Keb' Mo's new third album Slow Down is a first-rate recording that continues Kevin Moore's sophisticated but largely acoustic blend of blues, with pop and rock. Like Taj Mahal before him, Keb' Mo' draws on the blues traditions but has no qualms about going off into a melodic love song or a funky groove. His fine vocals and top-notch writing are further enhanced by the excellent musicianship shown by all on this record. Sonically the album is also mixed and recorded well. Many of the tracks lack any effects like reverberation, and thus have a very open, informal sound. Keb' Mo' and his co-producer John Lewis Parker do a good job in walking the line between a traditional sound and more sophisticated pop elements. But typical of major-label albums, the recording was compressed too much in the mastering process, taking away some of the dynamics that the acoustic instrumentation can afford. 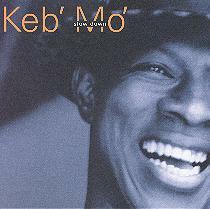 Keb' Mo' has already made a considerable impact on the music scene with his distinctive acoustic bluesy pop blend. His new album is just as likely to enjoy the kind of widespread praise and popularity of its predecessors.